Zanussi ovens make meal times easier, no matter what’s on the menu. Each Zanussi oven will heat your food evenly and ensure perfectly cooked food every time. If you like to invite friends over for dinner or you enjoy cooking for your family, a Zanussi oven is a great asset to have in the kitchen. You can make anything from huge multi-course meals to hearty stews the whole family will enjoy. If you like to bake bread or cakes, you’ll appreciate the even heat and accurate controls of your Zanussi oven. Zanussi ovens are available in a wide variety of styles and finishes including elegant black, classic white and professional stainless steel that will complement any kitchen. Zanussi ovens use the latest technology to reduce the amount of energy they use, which means they are better for the environment. If you’re looking for a state-of-the-art oven that will look great in your kitchen, check out our range of Smeg ovens. 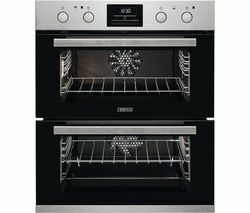 And if you’re looking for an affordable oven you can rely on, take a look at our complete collection of Bosch ovens.